Multiple severe trauma frequently leads to massive dysbalances of the human immune system. This phenomenon is known as "Systemic Inflammatory Response Syndrome (SIRS)". SIRS is connected to multiple organ failure and thereby entails higher morbidity and mortality in trauma patients. Pro-and anti-inflammatory cytokines such as Il-6, Il-8 and Il-10 seem to play a superior role in the development of SIRS. Several studies support the hypothesis that the very early cytokine release pattern determines the patients' subsequent clinical course. Most data about interleukins in trauma patients however refer to serum concentrations assessed sometime in the first 24 h, but there is only little information about release dynamics in a small-meshed time frame in the very initial post-trauma period. 58 multiple injured patients (Injury Severity Score > 16 points) were included. Blood samples were drawn on patient admission (not later then 90 minutes after trauma) and at 6 h, 12 h, 24 h, 48 h and 72 h. Il-6, Il-8 and Il-10 were measured using an automated chemiluminescence assay (IMMULITE, Siemens Healthcare Diagnostics GmbH). Interleukin levels were correlated to distinct epidemiological and clinical parameters. Interleukin serum concentrations are thoroughly elevated after trauma. Patients with haemorrhagic shock and consecutive massive RBC substitution (n = 27) exhibit higher Il-6, Il-8 and Il-10 levels as compared to patients with minor RBC transfusion extent (n = 31). 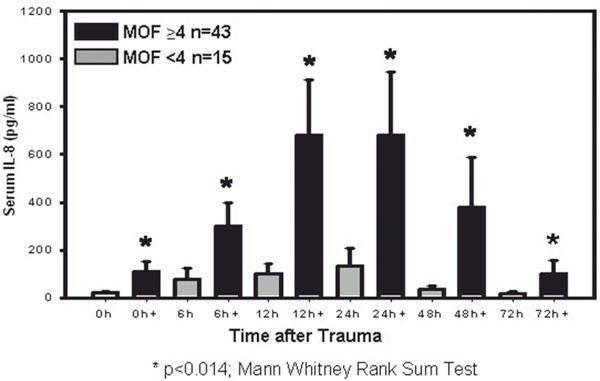 Interleukin levels also differentiate patients with MOF (n = 43) from such without MOF (n = 15) already at the earliest post trauma time (90 minutes). Il-6, Il-8 and Il-10 concentrations also significantly distinguish patients with adverse outcome (n = 11) from such with favourable outcome (n = 47). Exclusively Il-10 has significant correlation to injury severity (ISS > 35). The current study presents an image of the serum Il-6, 8 and 10 releases in multiple trauma patients in the very early post-trauma period. We could thereby demonstrate that interleukin levels can clearly differentiate the presence of hemorrhagic shock and subsequent massive blood product substitution, the development of multiple organ failure and clinical outcome. No significant connection to age, gender and brain injury could be detected. Most importantly, changes in interleukin levels can be observed in the very early posttraumatic phase, at the earliest 90 minutes after trauma. Multiple, severe trauma causes pervasive haemodynamic and metabolic alterations. This frequently leads to massive alterations of the human immune system and damages organ systems that have originally not been touched by the traumatic event. This phenomenon has been subsumed as "Systemic Inflammatory Response Syndrome" (SIRS), which affects both the specific and non-specific immune system [4, 26]. The presence of SIRS not seldom leads to multiple organ dysfunction (MODS), multiple organ failure (MOF) and thereby determines morbidity and mortality in multiple trauma patients [5, 22]. Regarding the development of SIRS, the last decade's research has postulated a major role of pro-and anti-inflammatory cytokines (for review, see [10, 16]). This has been especially well investigated during sepsis and septic multiple organ failure [30, 31]. In this respect, the pro-inflammatory interleukin-6 and 8, and the anti-inflammatory interleukin-10 have been quite well characterized (for review, see [15, 7]). In a precedent genome-wide mRNA Microarray study, we could identify Il-8 as a strong predictor for clinical outcome in multiple trauma patients . However it is not clear, how much of this mRNA is transcribed into protein and released into the systemic circulation. There are some experimental investigations on several cytokine levels in multiple, major trauma patients. The details about the connection between cytokine release and clinical entities are partly inconsistent. Some of these works gain information that interleukin levels are significantly influenced by diverse clinical entities, like for example gender  or MOF . In other studies, predictive values of MOF, outcome or connections to injury severity could not be certified [1, 33]. Most of these studies rather concentrate on assessing interleukin levels anytime during the first trauma day up to several days in a follow up investigation period [1, 21, 29]. Only little is known about interleukin release dynamics in the very early, initial post trauma phase. Furthermore, it remains unclear, if and how fast it is possible to differentiate various clinical events like the development of multiple organ dysfunction or definite clinical outcome using serum interleukin concentration levels. Therefore it was the aim of the current study to investigate on the time dynamic release of Il-6, Il-8 and Il-10 in the very early posttraumatic period focussing a time frame from not later than 90 minutes up to 72 h after trauma. Furthermore, we intended to identify epidemiological and clinical variables like age, gender, injury severity, massive red blood cell substitution, multiple organ failure and definite clinical outcome that significantly influence interleukin concentration alterations. The study was performed at our level 1 trauma centre following the Good Clinical Practice Guidelines. Ethical Committee Permission was obtained from the local institutional Review Board (reference number: 012/00). Patients at age having sustained blunt multiple injuries (Injury Severity Score (ISS) of > 16 points ) who reached the emergency department within 90 minutes after trauma were enrolled into the study. Signed informed consent was retrieved from the patients or a legal representative. Patients with isolated brain injury or such who died within the first 24 h after trauma were excluded from the study. Resuscitation and operative treatment of the patients was performed according to standard of care. Retrospectively, the patient collective was divided into dichotomous groups along the following epidemiological and clinical criteria: age, gender, presence of massive red blood cell substitution (more than 10 RBC units in the first 24 h after trauma), injury severity estimated by the Injury Severity Score (ISS), the development of MOF (MOF score ≥ 4), presence of concomitant head injury and definite clinical outcome after 90 days. As cut-off for the dichotomous groups for the age analyses, two different ages were used: 42 years and 56 years. To assess extent of hemorrhagic shock, base excess was measured and the Shock Index (ratio of the heart rate to systolic blood pressure) was calculated at every blood sampling time point. To investigate on the initial post-trauma period, blood samples were drawn on admission (not later then 90 minutes after trauma) and at 6, 12, 24, 48 and 72 h (standardized to the traumatic event). Initially, serum was separated from whole blood and stored at -80°C. Il-6, Il-8 and Il-10 concentrations were assessed using an automated chemiluminescence assay (IMMULITE®, Siemens Healthcare Diagnostics GmbH, Eschborn). 58 Patients fulfilled the entry criteria and were included into the study. Patients' ages ranged from 18 to 89 years, median 42 years. 40 patients were males, 18 were females. 27 patients required resuscitation with massive RBC substitution (more than 10 RBC units/24 h after trauma), and thereby were supplied with 24,3 ± 2,0 RBC units (mean ± SEM) and 25,5 ± 2,5 FFP units in the first 24 h (mean ± SEM). In contrast to that, patients with moderate RBC requirements received 3,6 ± 0,5 RBC units and 5,7 ± 0,9 FFP (mean ± SEM). Depth of shock estimated by Base Excess (BE) and Shock Index was calculated in both groups. The two clinical transfusion groups do not show any significant difference in Shock Index. However, on admission, serum base excess levels are found to be significantly lower (BE -9,2 ± 4,1, MW ± SEM) in patients with hemorrhagic shock and subsequent massive RBC substitution as compared to those who received not more than 10 RBC units/24 h (BE 4,8 ± 2,9; MW ± SEM; p < 0.001, t-test). 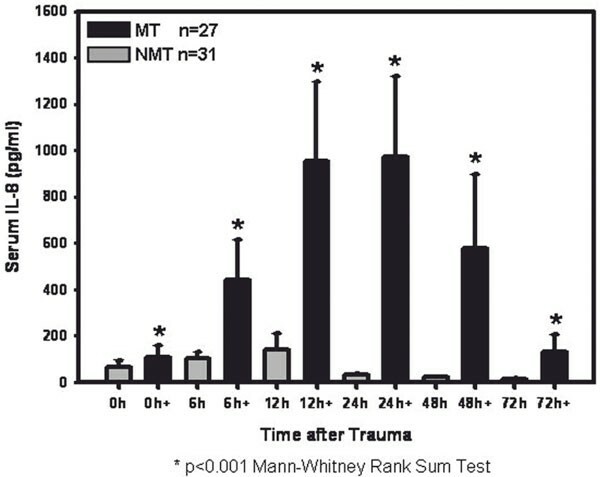 At 24 h post trauma, BE levels are again significantly different but vice versa (massive transfusion group: BE -0,3 ± 4,6 versus BE -2,2 ± 2,2; p < 0.01, Mann-Whitney-Rank-Sum test). During the observation period, 43 patients developed clinical signs of multiple organ failure (MOF score ≥ 4 points) in contrast to such who did not (15 patients; MOF score < 4 points). Injury Severity of 35 patients was below 35 points, whereas 23 Patients exceeded an ISS of 35 points. 11 of the patients deceased within 90 days after the traumatic event, whereas five died of fatal brain injury and 6 patients developed irreversible multiple organ failure. Table 1 gives the detailed clinical baseline characteristics of the whole patient collective. As compared to the baseline level on patients' admission, interleukin-6 was significantly enhanced at all following time points exhibiting a peak at 12 h (p < 0.05 ANOVA on Ranks) and a consecutive diminishment at 72 h. The dynamic of interleukin-8 release resembles the Il-6 curve, it is significantly elevated at 6, 12 and 24 h post trauma with a peak at 12 h (p < 0.05 ANOVA on Ranks). In contrast, Il-10 release shows its peak already at the initial time point after trauma; afterwards Il-10 concentrations continuously drop off at all the following time points (p < 0.05 ANOVA on Ranks). Two different age cut offs have been tested to divide the patient collective in two adverse groups. Regardless of which dichotomous cut-off we used (42 years or 55 years), no statistical significant differences in Il-6, Il-8 or Il-10 concentrations were detectable. Similarly, we could not detect any significant gender associated differences in cytokine concentrations, though there is a non-significant tendency to higher Il-6 and Il-10 levels in males in the first 12 h after trauma. Patients who require massive blood transfusion in the first 24 h after trauma exhibit throughout significantly higher interleukin levels as compared to those who did not. Il-6 is found to be up-regulated in patients after massive blood transfusion at 0 h, 6 h and 48 h (0 h/6 h: p < 0.018; 48 h: p < 0.048 Mann Whitney Rank Sum Test, Figure 1). Il-8 concentrations are increased in patients after massive RBC transfusion at 6 h to 72 h (p < 0.001 Mann Whitney Rank Sum Test; Figure 2). The counter-regulative Il-10 is also clearly up-regulated in patients after massive RBC substitution and significantly differentiates from patients with less RBC requirements at any investigation time point (0-48 h: p < 0.005, 72 h: p < 0.046; Mann Whitney Rank Sum Test; Figure 3). Il-6 dynamic depending on extent of RBC transfusion: This graph depicts IL-6 concentrations in patients after hemorrhagic shock and consecutive massive RBC substitution (≥ 10 RBC units/24 h, black columns, n = 27) as compared to those who gained less (grey columns, n = 31). Il-6 has significant higher serum levels in patients who received more than 10 RBC units/24 h at 0 h, 6 h and 48 h after trauma). Il-8 dynamic depending on extent of RBC transfusion: This graph depicts IL-8 concentrations depending on extent of RBC unit substitution. Il-8 exhibits significantly higher concentrations in patients after massive transfusion at all time points after trauma. Il-10 dynamic depending on extent of RBC transfusion: This figure shows IL-10 concentrations in depending on extent of RBC unit substitution. Il-10 serum levels significantly differentiate between the two transfusion groups in the early post-trauma period. Patients who developed clinical signs of multiple organ failure have considerably greater interleukin levels as compared to those who did not. Il-6 concentrations are significantly higher at all investigated time points ex-cept 48 h (0 h-24 h; 72 h: p < 0.026; Mann Whitney Rank Sum Test Figure 4). Also the pro-inflammatory Il-8 is thoroughly over expressed through the observation period (0 h-72 h: p < 0.014 Mann Whitney Rank Sum Test; Figure 5). 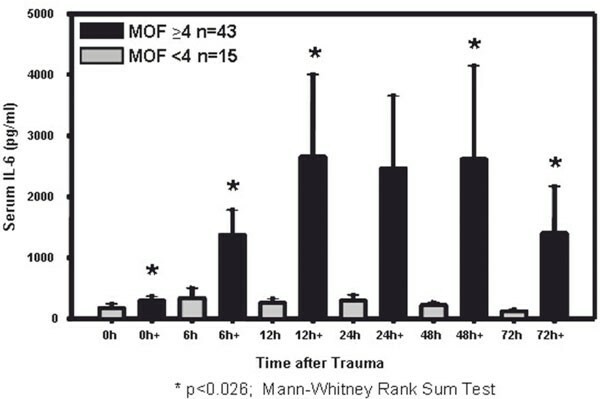 Il-10 however shows significant differences in the initial post-trauma-period (0 h, 12 h: p < 0.038 Mann Whitney Rank Sum Test; Figure 6), however, there are no significant distinctions between patients with MOF or without MOF at the later time points. Il-6 release depending on MOF development: This figure shows IL-6 expression in patients who developed clinical signs of MOF (black columns, n = 43) as compared to those who did not (grey columns, n = 15). Significant serum level differences can be measured at all blood sampling time points except at 48 h). Il-8 release depending on MOF development: This graph depicts IL-8 release depending on MOF development. Patients with MOF show significant higher Il-8 production at all investigated time points after trauma. Il-10 release depending on MOF development: This curve shows Il-10 serum correlated to MOF development. Il- 10 is significantly up-regulated at 0 h and 12 h after trauma in patients with signs of MOF. Statistical significant differential cytokine release depending on injury severity could only be observed in Il-10 at 6 h and 12 h post trauma. Thereby, patients who suffer from more severe injuries (ISS > 35) have higher Il-10 concentrations than the adverse collective (6 h: p < 0.006; 12 h: p < 0.005, Mann Whitney Rank Sum Test). Patients whose injury pattern includes traumatic brain injury show no significant differences but raised Il-6 and Il-8 levels by trend, as compared to patients without any injury of the central nervous system. Patients who decease within 90 days after the traumatic event have higher Il-6 levels at 0 h and 6 h (p < 0.005, Mann Whitney Rank Sum Test), the later observation time points show a clear trend but no significances due to large variability of the data. Il-8 concentrations differ in between 6 h and 24 h (6 h/24 h p < 0.01, 12 h p < 0.036 Mann Whitney Rank Sum Test). Il-10 does not exhibit significant concentrations differences between survivors and patients with adverse outcome in the initial post-trauma period, only at 72 h a significant discrimination can be observed (p < 0.018, Mann Whitney Rank Sum Test). In contrast to clinical parameters like massive blood transfusion and the development of multiple organ failure, patients with different clinical outcomes do not already differentiate in serum cytokine concentrations in the initial posttraumatic hour. Patients whose cause of death is multiple organ failure exhibit higher interleukin levels as those who died of fatal brain injury. However these differences are not significant. 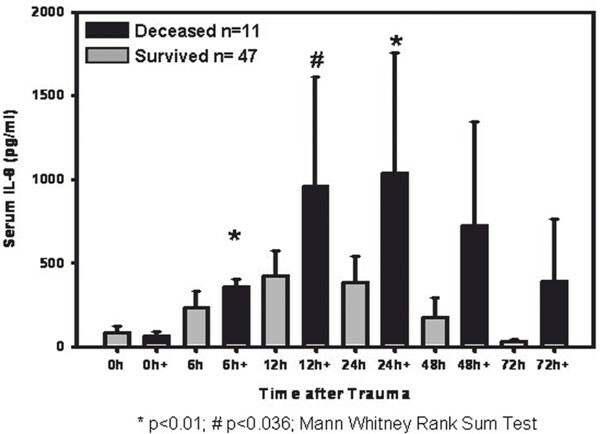 Il-8 course in correlation to clinical outcome (90-day survival): Patients who deceased (black columns, n = 11) exhibit significantly higher Il-8 serum concentrations as compared to those who survived the trauma (grey columns, n = 47) at 6 h-24 h after trauma. The current study presents a serum interleukin investigation in multiple trauma patients. We thereby purposefully concentrated on the very initial post-trauma time frame to investigate how early cytokine concentration changes can be observed. We therefore excluded patients of whom the first blood sample was gained later than 90 minutes after trauma and arranged serial, sequential blood sampling time points that were strictly standardized to the trauma time point. Interleukins and their impact in SIRS, sepsis, and after multiple injury has been well explored in the past years. We have learned that there are diverse influencing factors that enhance cytokine expression and that cytokine levels might be even useful indicators for the subsequent clinical course of patients on the intensive care unit [24, 35]. Moreover, cytokines have been used to build prediction rules for the development of multiple organ failure and outcome in sepsis and trauma patients [11, 27]. However, most of these studies tend to focus on the intermediate posttraumatic period, like 24 h post trauma or later . There is clearly less data about interleukin concentration dynamics in a small-meshed time frame of the very early phase after multiple, severe trauma. This is why we purposefully focused on the early posttrauma phase (0 h, 6 h, 12 h, 24 h, 48 h and 72 h) and thereby strictly excluded patients that were admitted to our emergency department later than 90 minutes after the traumatic event. One of the main targets of the current study was to investigate how early it is possible to detect interleukin concentration differences in the respecting adverse clinical groups. The determination of the cut offs for dividing the patients into dichotomous clinical groups comprises the risk of a certain bias. Whereas grouping patients according to gender and 90-day survival should not cause any problem, the definition of a cut off for age, massive blood transfusion or injury severity is comparably challenging. For assessing the interleukin concentration levels, we used an automated chemiluminescence assay instead of conventional ELISA, e.g.. The system has been validated in clinical studies before and enables fast access and single sample measurements , which is crucially important for a daily clinical use. One of the aims of our study was to purposefully investigate on the very early post injury interleukin concentration dynamics. The Il-6 and Il-8 curve is similar, with a significant raise at 6 h, a relatively early peak at 12 h and a continuous diminishment after 24 h. The counterregulating Il-10 in contrast exhibits its peak already at the admission time point, having only half the concentration 6 h later. This fits to up-regulation of Il-6 and Il-8, as one of the anti-inflammatory attributes of Il-10 means blocking the synthesis of the two pro-inflammatory cytokines . We have examined two different age cut offs, the limit of 42 years was chosen because it is the median age of our patient collective. In accordance to the age classification by Kuhne et al. , the second age limit we checked was 55 years. However, in both analyses we could not show any age associated up or down-regulation of the investigated interleukins. In contrast to Sperry et al. , we could not see a significant association between Il-6 concentrations and male gender. Our data show a non-significant tendency of higher interleukin 6, 8, and 10 concentrations, but exclusively in the first 12 h post trauma. Patients that had received ≥ 10 RBC units in the first 24 hours after trauma were assorted to the massive RBC transfusion group according to the work of Como et al. . Massive substitution of RBC units mostly entails the concomitant application of Fresh Frozen Plasma. However, amounts of transfused FFPs are similar to the total amounts of RBCs in the respective groups. The three interleukins are continuously over-expressed in patients after haemorrhage and subsequent massive blood product substitution. There are other studies in the literature that report the enhancement of the pro-inflammatory answer after RBC substitution [13, 2]. It is an interesting question to clarify, if these cytokines are produced from the host, or if they originally come from the RBC units itself and are thereby transfused into the systemic circulation of the patients. Furthermore it is not clear, if such external interleukins are simply eliminated or if they possibly influence or damage the host's immune system. An additional possible external source for cytokines might be remaining leukocytes in the RBC unit. Contamination with foreign immune cells is an important bias as investigating on patients after massive blood transfusion. In our study, patients received leukocyte depleted packed red blood cell units. These units contain a residual leukocyte population between 0.5 and 0.7 × 106 per unit . We consider this as to be a relatively small amount of cells. However, they are a potential source of external cytokine production. Patients who undergo massive RBC substitution suffer of course from deep haemorrhagic shock. The interleukin patterns we see in those patients are presumably not only due to the RBC substitution but result from both - the extensive blood loss and subsequent blood product substitution. In this respect however, there are data that identifies blood transfusion as an independent risk factor for the development of SIRS, multiple organ failure and adverse outcome in trauma patients [12, 25]. These investigations in turn encourage the presumption that the post-transfusion cytokine up-regulation is to be largely understood as a host reaction on foreign protein and leads to hyper-inflammatory reactions that may promote a systemic inflammatory response syndrome and consecutive multiple organ dysfunction. It has been reported before, that injury severity and extent of tissue damage influences cytokine release . The current study did not reveal significant interleukin levels for Il-6 and Il-8 depending on the ISS score. One reason for that may be that it is a crucial point to define ISS cut-offs for arranging dichotomous clinical groups. As there is to our knowledge no information or recommendation for any ISS limits, we chose the median ISS of our collective (35 points). Patients with more severe injury show a significant correlation with higher Il-10 levels at 6 and 12 sh after trauma. The presence of head injury defined by a positive CCT scan is not correlated to specific interleukin patterns. This is in line with the animal experiment of Kamm et al, who could detect elevated Il-10 levels in injured brain cells but not in the systemic circulation. They conclude, that Il-10 is a strong indicator of brain injury but possibly carries out their actions exclusively in the brain . This is in line with our precedent investigation of cerebrospinal fluid in patients with isolated traumatic brain injury. Il-10-levels in survivors are significantly lower as in patients with adverse outcome after severe TBI . 5 of our investigated patients died of fatal brain injury and consecutive brain death. Though it is a well known fact that brain death per se strongly triggers a systemic inflammatory response syndrome , in our study interleukin levels of those patients are by trend lower than the concentrations of patients who died of multiple organ failure. This subgroup analysis however is not significant which may be due to the small size of patients with unfavourable outcome. Similar to the cytokine course of patients with massive RBC substitution, the three investigated interleukins Il-6 and Il-8 are constantly up-regulated in patients with clinical signs of multiple organ failure (defined by a modified MOF-score ≥ 4 points ). This is absolutely conform to other works in major trauma patients. Lausevic et al. 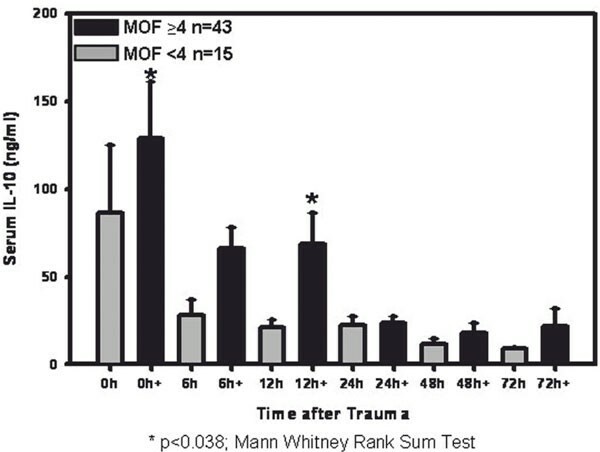 suggests interleukin profiles for predicting the development of MOF in trauma patients . 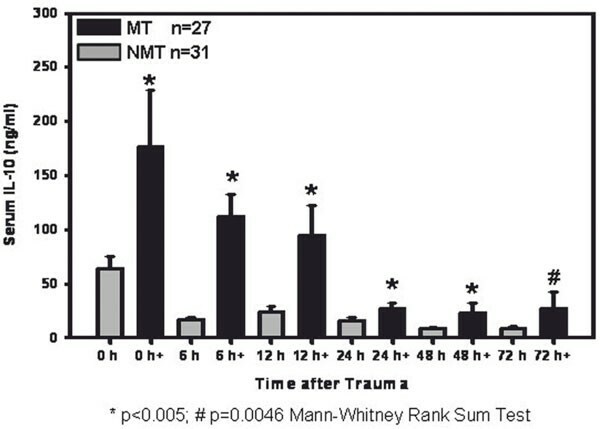 The first blood sample in this study was anytime within the first 24 h after trauma. Our data shows that interleukin levels substantially differentiate patients that will develop clinical signs of MOF in the further post trauma course from such who will not already 90 minutes post trauma. In the first 24 h after trauma, Il-6 and Il-8 concentrations in patients who survived the trauma were significantly lower as in those who deceased. This is especially interesting as Il-8 mRNA was identified to be one of the strongest outcome markers in our precedent genomewide mRNA expression study . These differences apparently emerge both -on the transcriptional level and in the systemic circulation. In contrast to these findings, Akkose et al conducted a study where interleukin-8 levels could not be correlated to major trauma patients after haemorrhagic shock . The reasons therefore may consist in the smaller patient collective in that study. Surprisingly, Il-10 only exhibits significant concentration differences at 72 h post trauma in deceased patients as compared to those who survived. In contrast to precedent analyses regarding multiple organ failure or massive transfusion, interleukin concentrations do not show the very early differences already at 90 minutes post trauma. The earliest significant different levels can be measured 6 h post trauma. 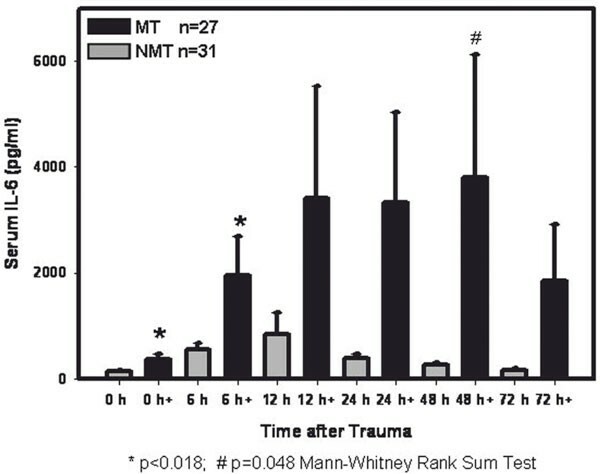 The current study presents an image of the serum interleukin 6, 8 and 10 release in multiple trauma patients in a very early post-trauma time frame (90 minutes up to 72 h after trauma). We could thereby show that interleukin levels can clearly differentiate various clinical entities like the presence of haemorrhagic shock and subsequent massive blood product substitution, the development of clinical signs of multiple organ failure and finally clinical outcome. With limitations, interleukin levels have also been correlated to injury severity, whereas no significant connections to age, gender and brain injury could be detected. The substantially new information of this study is that interleukin levels differentiate patients concerning their further clinical course already 90 minutes after the trauma. These findings might set the focus of further experimental study designs on the very initial post-trauma period. We gratefully acknowledge the invaluable support of our AG Trauma/Resuscitation coworkers Mareen Brumann and Thomas Herrmann. Furthermore, we would like to thank the staff members of Siemens Healthcare Diagnostics GmbH, PD Dr. Wolfgang Hildebrandt, Dr. Doris Schmidt and Dr. Peter Zwerenz for their extensive support. Conflict of interest statement: The authors thereby state that there are no conflicts of interest concerning this work.